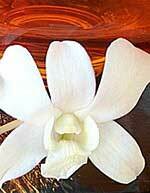 In many parts of Southeast Asia, white Dendrobium is a favorite flower for anniversary. It symbolizes purity, good health, and good spirits. 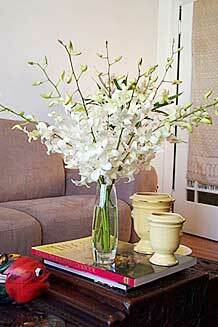 In America, this orchid is a sure way to bring elegance and sophistication to your home. Easy to arrange and compatible with any decor, it's perfect on a bedside table or kitchen counter. The blooms last for up to 10-12 days with proper care. Imported. The perfect vase for the long, slender stems of snow white Dendrobium is a vessel of handblown crystal vase with a bubble blown into the clear, weighted base (as shown). Own both of them now and enjoy! The vase stands at approximately 7.5" in height. For vintage and contemporary vases, view our collection. 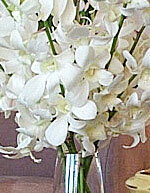 The arrangement above was created with 10 perfect stems of freshly cut Dendrobium in our classic glass vase. Each purchase includes care instructions and an exquisite gift card for your personal message. Each stem is approximately 12-15 inches tall bearing 15-18 blooms and comes with individual water vials. The flowers measure approximately 2.5-3 inches in diameter.